This stretch contains only the hillfort of Maes Knoll, which is located just south of the southernmost outskirts of Bristol. Maes Knoll commands the surrounding countryside and has some spectacular views of north Somerset. As described below, it can be reached fairly easy by car or even on foot, and it represents therefore one of the best ways to get an idea of Wansdyke. By car from Bristol. Follow the A 37 to Shepton Mallet, past the Black Lion public house and over the disused stone rail bridge, and after you pass the sign to Whitchurch, take the first minor road to the right (to Norton Malreward). Then travel down this lane past the garden center and over the small rail bridge for about 2 kms to the sign for that hamlet and park the car at the Norton Lane crossroads, where youll find a permissive track to your right, leading up to Maes Knoll. On foot from Bristol. By walking across the fields from East Dundry Lane, although driving there may be difficult for parking. It's for that reason, it may be better to walk up through the lane from the bottom. One can see the camp from the Bristol suburbs by traveling up Fortfield Road and then looking straight ahead. Three quarters way up the lane, there is an opening into the field. Walk along what appears to be a trodden path until you come to a gate where you climb over into the next field. Walk along the hedges until you come to the camp. During the summer months, it may well be hidden from view by the foliage. From Weston-super-Mare and the M5, follow the A 371 to Bristol, and the A 368 all the way to Bishop Sutton. Then after about 2 kilometres take the minor road left to Stanton Drew (If you have the time, DO visit the megalithic Stone Circles here! I did!). Passing through the village go right at the T-junction, and immediately left to Norton Malreward. 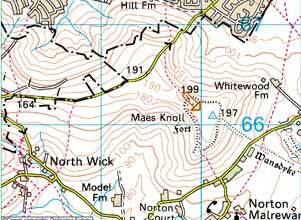 Pass through there, and best find a spot to park at the next crossroads, and take the track leading up to Maes Knoll. Alternatively, take the A 371 and the A 368 to Bristol, but at Churchill take the A 38 and drive on to Barrow Common. Go right to Dundry, East Dundry and to the outskirts of Bristol, where Maes Knoll is clearly visible. This is up Fortfield Road, from where a track to the right leads to the camp (see above - on foot from Bristol). From Wells, follow the A 39 and then the A 37 to Bristol. When you passed the village of Pensford, in Belluton take the B 3130 left until after c. 2 kms you reach the sign for Norton Malreward to your right. Pass through there, and best find a spot to park at the next crossroads, and take the track described above. From Shepton Mallet, follow the A37 to Bristol, and continue as described above (from Wells). Alternatively, pass through Pensford and continue to Bristol, where youll pass Wansdyke just across the old railway, a kilometer beyond the B3130. Take the next minor road left, and again after that, so youll cross Wansdyke again, until you arrive at the crossroads I mentioned above. From Frome, follow the A 362 to Radstock and beyond to Farrington Gurney, where you join the A 37 and continue as described above (from Wells). click here to return to West Wansdyke, section 1.